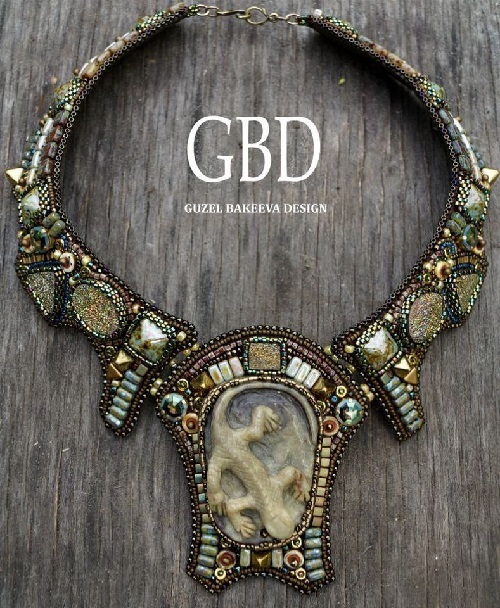 Guzel Bakeeva – professional designer of jewelry and accessories. 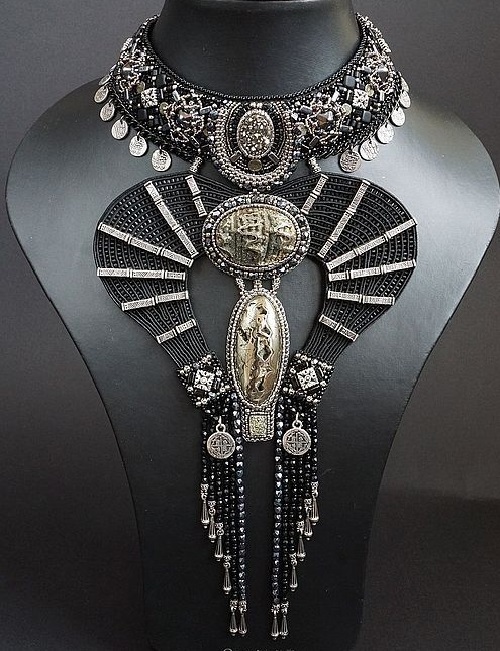 She has received higher education in the field of design, and was lucky enough to become a finalist and winner of Russian and international beaded jewellery competitions. In 2011, she graduated from British Higher School of Art and Design. 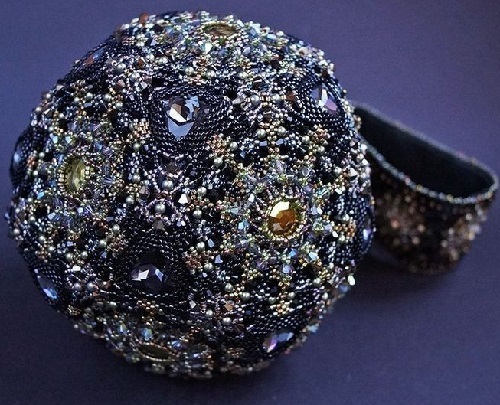 For the first time, in June 2009, her work – elegant beaded handbag Iris Mist reached the final of the international competition of Japanese concern producer of beads Toho and was presented at the International Bead exhibition Bead & Button Show (USA) among the 90 best bead work from around the world in 2010. 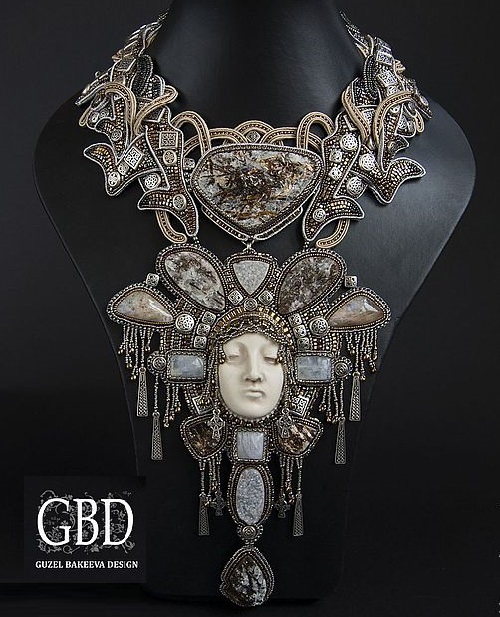 She was a lucky finalist at the prestigious jewelry competition Bead Dreams. 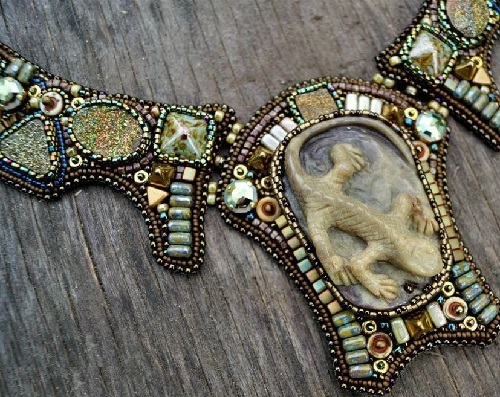 In 2012 she won the main prize of the contest – Grand Prix, her necklace Predator was an absolute winner. Since 2012, she has been the Ambassador of Swarovski in Russia. 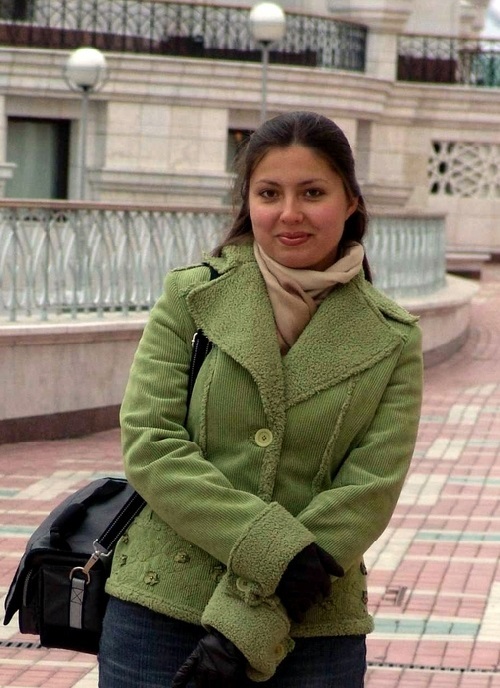 Guzel has been conducting master classes every month, since 2013. 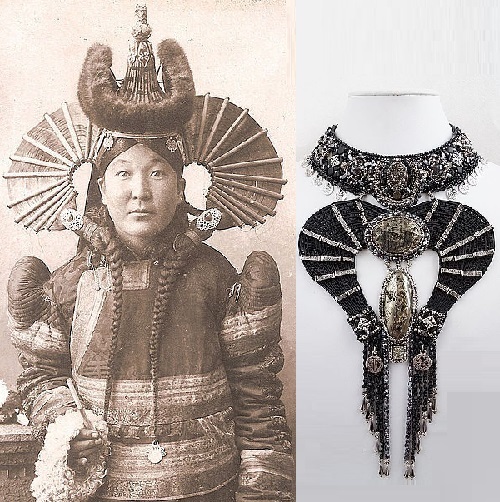 One of the most bizarre necklaces in her collection, was born under the influence of the images of the Mongol chief women in old photographs, these ladies have inspired George Lucas to create the image of Amidala. 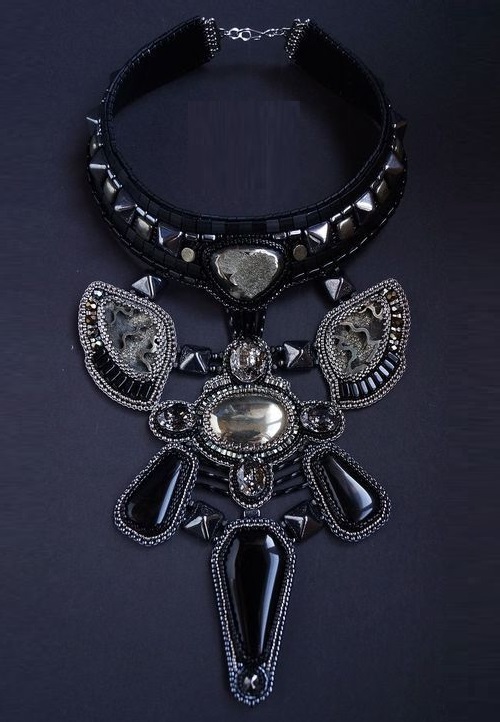 Going to the North necklace is not just a decoration, this is saga, the story told in metal and stone. Such work is done once a year, as a challenge to the master. This Celtic tale is about griffins and long winter. 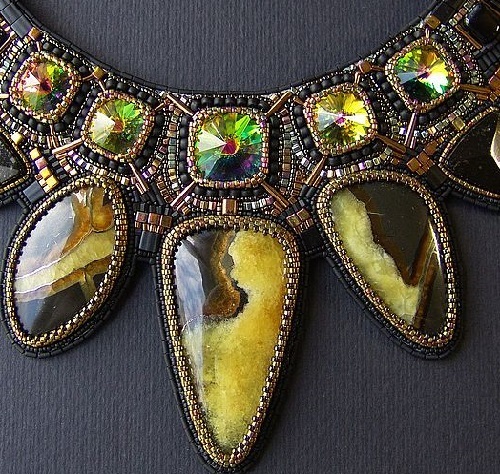 To highlight the “cold” history, the jeweler used in the work Russian Northern stones – astrophyllite, Belomorite, Phillipsite. 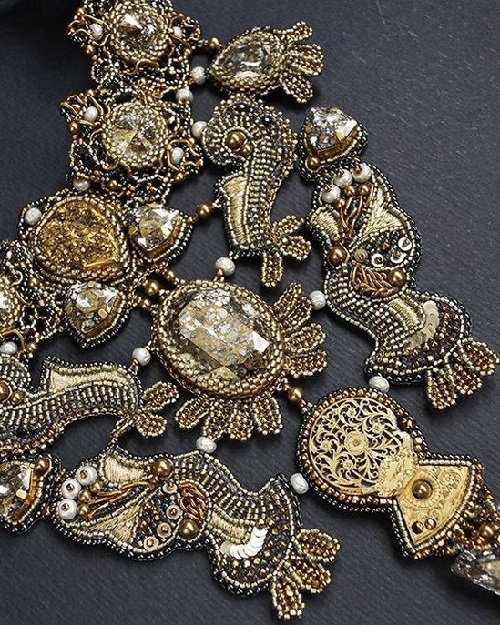 Necklace Cinderella – the result of passion for the art of the Middle Ages, the English school of gold embroidery, tapestries and fine examples of ancient embroidery. 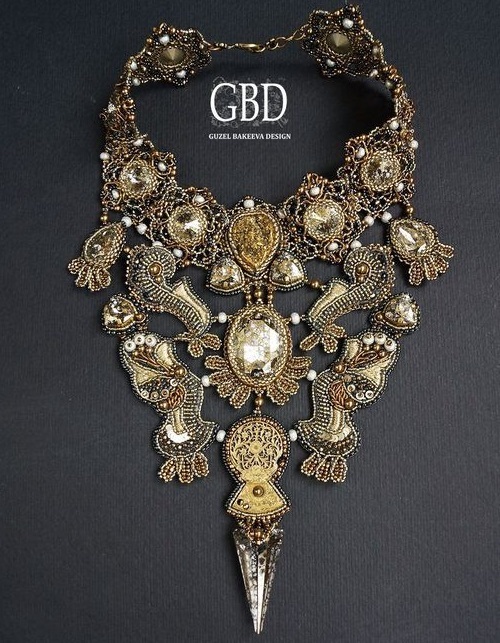 Collier turned eclectic, it combines modern techniques of embroidery, along with gold thread embroidery and gold thread, contemporary forms and elements of vintage lace, cutting-edge materials – swarovski gold patina and antique Victorian detail of the clock. Handbag Abyss is a perfect sphere, constructed of perfect geometric shapes. This work is inspired by the traditions of the Islamic sacred geometry, based on the element of ten-pointed star. 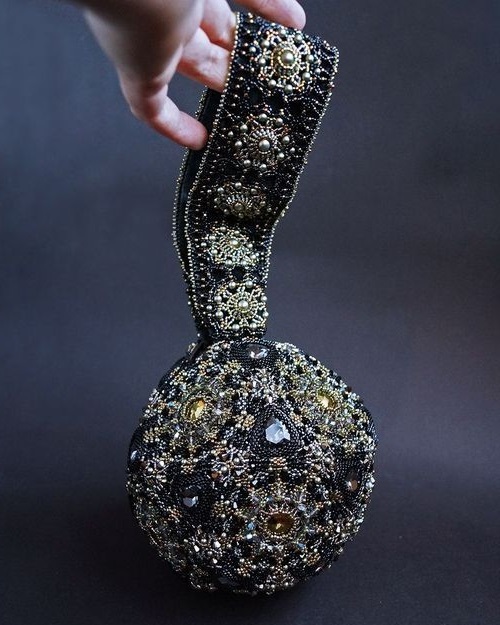 The sphere shape of handbag – a kind of a universe full of stars. Handbag was made specifically for the Swarovski competition. 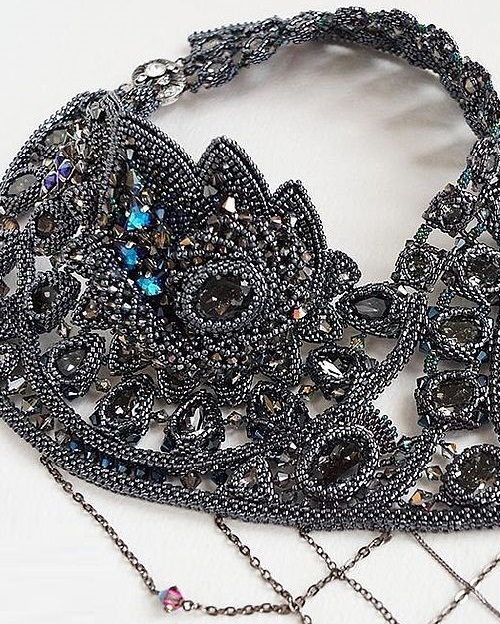 Strap of handbag – antique French velvet, velvet top, materials used – Swarovski crystals, pearls, Japanese seed beads Toho, antique velvet, leather. 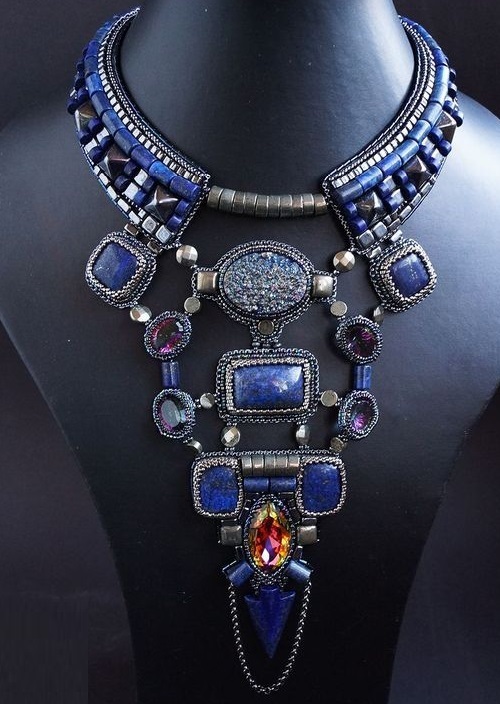 Simbirtsite necklace. Simbirtsite – is a local name, from Siberian town of Simbirsk, for a stone similar to Calcite. 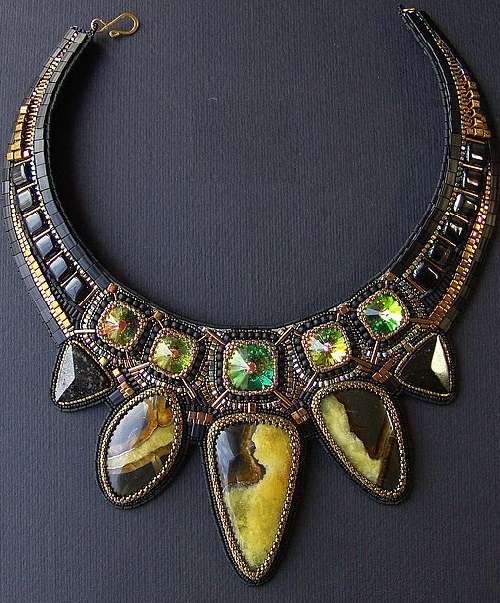 Stylish bright necklace, mix of lemon yellow and black, simbirtsite stones with luxurious Swarovski crystals and a matte black beads.